Our product of the month for the month of January is our Honey and Spelt half Pan. This is a 400g product containing spelt flour. Some of the health benefits of spelt include its ability to help in regulating the body’s metabolism, increase circulation, build strong bones, improve the immune system, boosting digestive function, lowering blood sugar and reducing cholesterol levels in the body. The honey in this product gives it that unique taste. Why not try our Honey and Spelt this month! 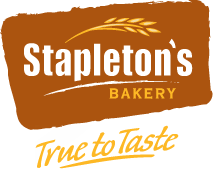 Congratulations to Nuala Ryan of Borrisoleigh on winning the €100 hamper at the Stapletons Stand. Well done Nuala! We hope you enjoy your hamper!